How can we build a more compelling, evidence-based case for businesses to move into our region? • Which sectors give our region a comparative advantage over other regions? • What industries give our region the best opportunities for growth? • Which sectors in our region might be at risk? If you can answer these questions successfully, then you will be in a great place to build a compelling, evidence-based strategy for growing and attracting new business into your region. The good news is that we are about to introduce a new tool which will enable you to do just this. 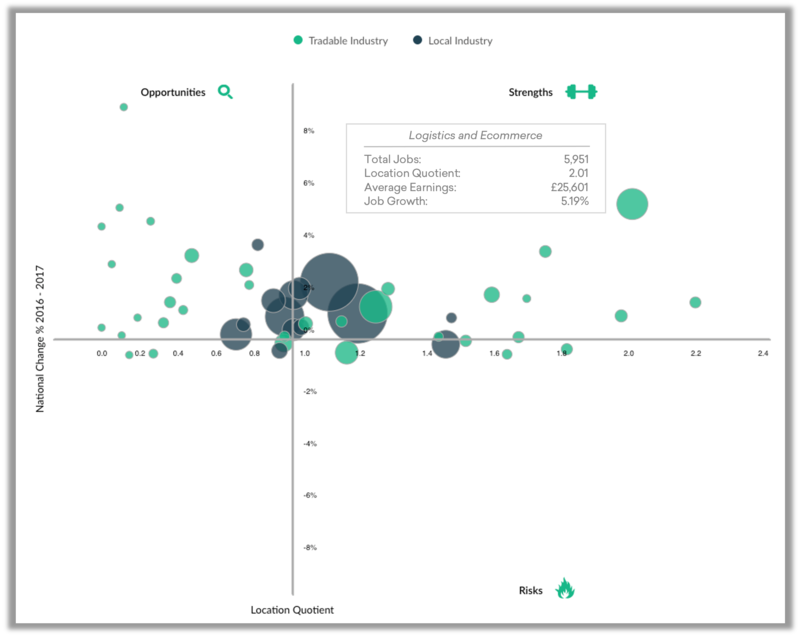 Strengths: Industries that are growing nationally and in which your region has a comparative advantage, meaning your area is well placed to benefit from the overall growth. Opportunities: Industries that are growing nationally, and in which your region has a healthy presence rather than a comparative advantage, so presenting opportunities for growth. Risks: Industries in which your region enjoys a comparative advantage, but which are set to decline nationally, indicating that they may be under threat. Having identified the overarching clusters in your region, the tool also allows users to drill down into any of them to take a closer look at their constituent industries. For instance, you might find that your region has a comparative advantage in Logistics and Ecommerce, and that it is set to grow nationally over the next few years. But it is only when you dive into the cluster that you can begin to see where the real opportunities might be. So your region might have a very strong comparative advantage in warehousing and storage, for example, but be relatively weak in online retail sales. However, because these two specific industries have many shared characteristics — which is why they belong in the same cluster — the opportunity to attract more online retail businesses into your region becomes clear, presenting exciting possibilities. In other words, by helping you understand the relative strengths and weaknesses your region has in terms of the clusters themselves, and then enabling you to identify the relative strengths and weaknesses of the specific sectors within the clusters, as an economic developer you will not only be in a much better position to plan a sound strategy for attracting new business into your region, you will also be able to present your plans to others in your organisation using robust and clear evidence. However, rather than simply telling you what Sector Strengthfinder can do for you and your region, we’d much rather show you. To enable this, we have set up a calendar, which you can go onto to book a free demonstration, which we will tailor to your region. You can choose from three options, which are a 15 minute call, a 30 minute look at the tool, or a full hour long demonstration. All you need to do is click on the button below, book in a slot at a time that suits you best, and we’ll show you how Sector Strengthfinder can help you plan a compelling strategy for bringing new business into your region.